College football top 25: Is Michigan football a playoff team yet? College football top 25: U-M a playoff team? This Week's Obsession: Order Restored? College football top 25: Is U-M a Playoff team? Michigan football trash talks its way back into rivalry with MSU - finally! What does Michigan football's win over MSU mean for Jim Harbaugh? Is Michigan football in the lead for 5-star DE Zach Harrison? Michigan's Jim Harbaugh has no excuses. He must beat MSU on road. Michigan football ran over Wisconsin; can it do it vs. Spartans? College football top 25: U-M top 5? MSU in? Michigan football: How good are they? How will Michigan State attack? Michigan football vs. Wisconsin: Live game blog begins at 7:30 p.m. Recruiting mailbag: Top need for MSU in 2019; any WR in mix for U-M? Welcome to our Michigan football live blog as the Wolverines take on Maryland. Feel free to follow along or join in the live analysis and banter. Michigan leads Maryland 17-7 at the half. Observations from Michigan Stadium in Ann Arbor. It's your turn to rate Michigan football in the 42-21 win over Maryland on Saturday at the Big House. Michigan football vs. Maryland kickoff now 1:15 p.m.
Michigan-Maryland kickoff suspended due to weather. New time is tentatively slated for 1:15 p.m. Photos from this Big Ten conference matchup in Evanston, Ill.
Michigan Wolverines junior Zach Gentry leads the team in receptions and receiving yards, after a career-best game against Maryland. It was announced that the Michigan football and Michigan State football game on Oct. 20 at Spartan Stadium will kick off at noon. Michigan football is having fun on the field again. And results have followed. Michigan football coach Jim Harbaugh speaks to the media on Monday, Oct. 8, 2018, in Ann Arbor. Michigan football coach Jim Harbaugh didn't offer too many details with regard to Tarik Black's injury. Your guide to Michigan's 2018 football schedule, including start times, TV showings and results. As the season goes on, Jim Harbaugh and the Michigan Wolverines are adding more layers to their offense. 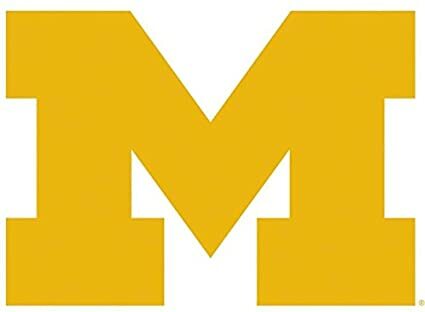 Free Press sports writers Shawn Windsor, Nick Baumgardner and Orion Sang discuss their takeaways from Michigan's five-game win streak, Oct. 6, 2018. Michigan coach Jim Harbaugh likes the progress of Shea Patterson and the offense, after 42-21 win over Maryland, Oct. 6, 2018. Michigan tops Maryland, 42-21. Free Press sports writer Nick Baumgardner rates the Wolverines.